You’re here because you want to know how to learn Japanese, right? There are hundreds of different Japanese courses and textbooks out there, and there’s something for every budget. You could spend $20 on a textbook, a few hundred on private lessons, or if you’ve got a few thousand $$$ to spare could you even attend a language school in Japan! But luckily, there are also LOTS of different ways to learn Japanese online for free. Yes, so long as you’ve got a computer and internet connection, you can get started on your Japanese journey right now without spending a single yen. In this post, I’m going to teach you how to learn Japanese for free – from complete online courses, to free resources for practicing grammar, reading, writing and listening. I hope you find the best free Japanese course for you! Duolingo is a popular language learning site and app, and last year they released their Japanese course. It’s a great way to learn beginner’s Japanese for free! What I really like about Duolingo is that you can learn Japanese in just 5 minutes a day. When you sign up, they’ll ask you how long you want to study each day (5 minutes, 10 minutes etc) and they’ll send you a reminder at the same time each day. This is a really great way to study consistently and build up your Japanese day after day! Duolingo is really fun to use. It has lots of short, game-like activities. It is quite addictive and very different from the textbook way of studying. Duolingo is completely free to use because they make money from advertising. So you will never be charged. There is an online version and a mobile app version. They sync with each other, so you can study in whichever version is more convenient for you. The downside is that the Duolingo Japanese course currently doesn’t go very far (around JLPT N5 level or less). So if you are an intermediate or advanced learner, don’t bother with Duolingo. I’d recommend the Duolingo Japanese course to any beginner looking to learn Japanese free in a fun way, who doesn’t like traditional textbook or classroom ways of studying! It’s especially good for people who want to learn Japanese for travelling. You will learn lots of words related to food and drink, and there’s even a special bonus lesson about the Tokyo Olympics. See more (including screenshots) in my Duolingo Japanese review. JapanesePod101 is one of the most famous Japanese online courses, and for good reason. It’s been around for years and has literally thousands of audio and video lessons, accompanied by printable lesson notes, interactive quizzes, flashcard decks and more. Lessons run all the way from absolute beginner to advanced, and they have special courses for JLPT preparation too. You can get a free lifetime membership at JapanesePod101 which gives you access to all the newest lessons. There are 3 to 5 new lessons published every week, and free members get access to all the new lessons for three weeks. You can also get extras such as word of the day emails and special one-off vocab lessons for free. I think the JapanesePod101 free membership is great for beginners. However, when you get to a higher level, you will probably need to pay for membership to access the older lessons in the archives, because most of the new free lessons are beginner level. There are several different membership levels depending on how much access you need, but the cheapest (basic) membership starts at just $4 a month. JapanesePod101 is audio-based, so I recommend it as the best Japanese course for someone who wants to learn Japanese while driving or walking. You can then check the written lesson notes online to review grammar points and new vocabulary. It’s a great option for someone who likes a more structured approach to language learning (as opposed to the gamified approach of Duolingo) but with fun, modern content and lots about modern Japanese culture. Take a look at my full JapanesePod101 review for a sneak peek inside the Premium membership area! Easy Japanese is an online course made by the Japanese national broadcaster, NHK. It’s an audio and text-based course of 48 lessons for beginners. It’s completely free, and you don’t have to sign up or become a member. The course is designed for people living in Japan. It covers a lot of everyday living situations such as going to class, going shopping, even what to do in an earthquake. The course is even available in 17 different languages! So if English isn’t your first language, and you’d like to learn Japanese in your own language, take a look. Personally, I think this course is a little bit boring and very basic. But I prefer more interactive courses. If you want to learn essential Japanese words, phrases and grammar for free, this is still a good course. Someone moving to Japan who wants to learn the essentials. The Japan Foundation is an organization that promotes Japanese language and culture around the world. They have a few different courses where you can learn Japanese free online. I’m going to talk about the ‘Marugoto’ course, because it’s the best general beginner course. There are a few other online courses such as Kansai Dialect and Introduction to Haiku. You can see a full list here. Marugoto has lots of pictures and lots of listening practice. It has an easy to use, fun and interactive format. There are actually two options you can choose from: Marugoto ‘katsudoo’ or ‘katsudoo & rikai’. The ‘katsudoo’ course focuses on listening and speaking for everyday situations. The other option covers the same listening and speaking lessons, but you will also learn how to read and write in Japanese and you will study more grammar. The course is available in a few different languages, including Spanish, Indonesian and Thai. To take the course, you have to register (for free) on the Japan Foundation Minato e-learning portal. Even though this is a free, online self-study course, it is more structured and formal than the other courses on this list. You submit assignments online and even get a certificate at the end. There is also an online noticeboard for students where you can chat about your experience learning Japanese with other students across the world. So, I recommend Marugoto for serious students who would like to take a structured Japanese course for free. As you would expect from the website name, this site teaches Japanese for free. It currently has a course of 28 basic lessons for complete beginners, plus a lot of special lessons, such as vocabulary on different themes. This site is kind of basic compared to other courses on this list. It doesn’t have any interactive games or quizzes. It’s mainly text, with some audio recordings of the different sample sentences. But the site is quite cute, and the explanations are easy to understand. Anyone can check out these lessons without registering. These free Japanese lessons would be good for someone who learns well from textbooks. Do you like to see things written down, and read lots of examples with no fuss? This site might be a good option for you. Tae Kim’s guide is a comprehensive and completely free guide to Japanese grammar. Available online, or as a free pdf or app. JGram is an excellent resource if you’re preparing for the JLPT! This site covers all the grammar points for every level of the JLPT. The page for each grammar point provides an explanation, plus loads of sample sentences. The sample sentences are user submitted, so there’s always a big variety. Imabi is a free site about Japanese grammar with very thorough explanations and lots of examples. Want to learn how to read and write the Japanese scripts, hiragana and katakana? This free printable workbook will teach you, and has lots of space for practising your handwriting on grid squares. Note: it is produced by JapanesePod101 so you will need to sign up for a free account, but all you need is an email – no payment required. This free printable workbook is the perfect introduction to kanji for beginners. It works on teaching ‘radicals’ – the building blocks of kanji. By teaching essential radicals first, this book introduces over 1500 kanji. You will need a free JapanesePod101 account for this book too, but it takes less than a minute to sign up! Jisho is a free Japanese online dictionary. I use it all the time! In addition to the standard dictionary function, there are some cool features such as sentence search. You can also view lists of words and kanji by JLPT level. I have a list of over 40 sites for free Japanese reading practice online at every level. At Lang8, you can practise your Japanese writing skills for free online by posting daily diary entries in Japanese. Your writing will be corrected by a native speaker. Memrise is another great flashcard app with pre-loaded Japanese decks. The Japanese language Stack Exchange is a good place to get your grammar questions answered. The questions tend to be intermediate or higher level. You can search to see if anyone’s asked your question before, or just check in and browse to learn random new stuff. MLC Japanese is actually a real life Japanese school in Tokyo. They share tons of resources on their website for free. There is not enough information to complete a full course of study for free, but they have some printable worksheets and lots of example sentences for different grammar points, so it can be a good extra resource to check when you’re looking for more help. One of my favourite ways to learn Japanese is YouTube! There are literally thousands of cool Japanese videos at every level, and of course they’re all free. I have a separate article on the best YouTube channels to learn Japanese, but some of my favourites are JapanesePod101 (all levels, and separate from their online course), Japanese Ammo (beginner-intermediate, very cute!) and Nihongo no Mori (intermediate-advanced, good for JLPT). 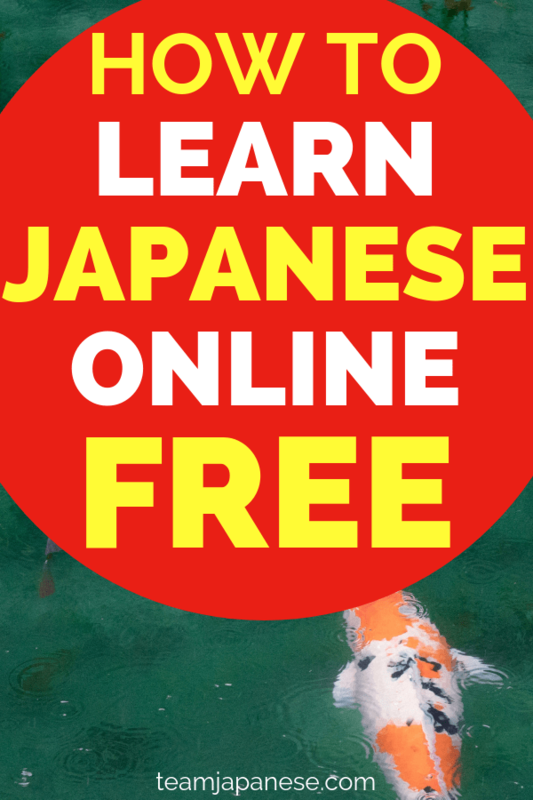 Do you know any more great resource to learn Japanese for free online? Please share with us in the comments!